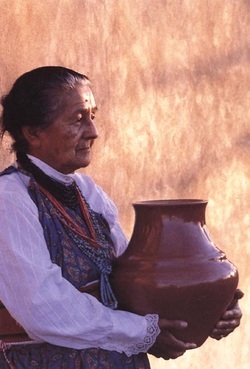 Margaret Tafoya (1904-2001) was the matriarch of Santa Clara Pueblo potters. Margaret learned the art of making pottery from her parents Sara Fina Guiterrez Tafoya (1863-1949) and Jose Geronimo Tafoya (1863-1955). Sara Fina was considered the leading potter of Santa Clara in her day, as the master of making exceptionally large, finely polished blackware. She also occasionally made redware, micaceous clay storage jars and other smaller utilitarian forms. Margaret’s father was primarily concerned with raising food for the family but he was also known to make pottery and helped Sara Fina with many aspects of her pottery production. In 1924, Margaret married her husband Alcario Tafoya (1900-1995). Alcario and Margaret worked together making pottery just as her mother and father had done. Margaret and Sara Fina’s husbands both helped with the tasks of digging and preparing the clay and the firing of the pots. Alcario also helped Margaret with the creation and carving of designs on her pots. Like her mother, Margaret molded her pots using the traditional coiling method. Margaret continued her mother’s tradition of making exceptionally large pots, with finely polished surfaces and simple carved designs. Her “bear paw” motif and deeply carved pueblo symbols like the Avanyu (water serpent) and kiva steps around the shoulder of her jars have become signature trademarks of the Tafoya family pottery. By the 1960s Margaret’s pottery had become famous. She received the Best of Show Award in 1978 and 1979 at the Santa Fe Indian Market. In 1984, the National Endowment for the Arts awarded her a National Heritage Fellowship in recognition of her accomplishments. She was also recognized and received an award as a Master Traditional Artist in 1985. Margaret and her husband Alcario raised thirteen children, many of which are carrying on the Tafoya family tradition of pottery making. Those actively making pottery today include: Virginia Ebelacker, Lee Tafoya, Jennie Trammel, Toni Roller, Luann Tafoya, Mary Esther Archuleta and Shirley Tafoya. References Ellen, Mary and Susan McDonald (editor)- Margaret Tafoya: A Tewa Potters Heritage and Legacy. 1986. Dillingham, Rick - Fourteen Families in Pueblo Pottery. 2002. Hayes, Alan and John Blom - Southwestern Pottery: Anasazi to Zuni. 1996. Peterson, Susan - Pottery of American Indian Women: The Legacy of Generations. 2000. Schaaf, Gregory - Pueblo Indian Pottery: 750 Artist Biographies. 2000.